My husband ate some of this barbecued chicken at work when his friend brought it in for lunch. Derek asked for the recipe. Where I grew up volunteer fire companies, Boy Scouts and local schools would sell BBQ chicken as fundraisers. 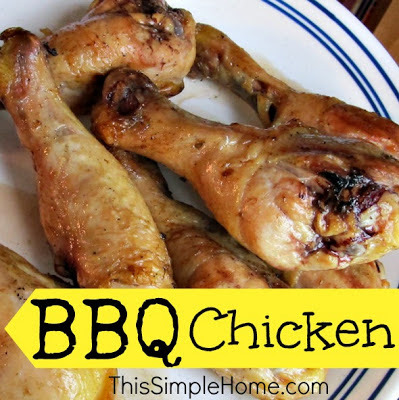 This BBQ chicken smelled and tasted like THAT that kind of chicken...but Derek and my dad both agree that this has more flavor throughout the chicken and not just on the skin! We really enjoyed these grilled chicken drumsticks. Preheat grill to 250°. Mix together all ingredients. Spray or brush (or even dip) the sauce on the chicken as you place each piece of meat on the grill. Spray or brush chicken with sauce frequently. Use all of the sauce before chicken is finished cooking. Grill drumsticks for about 45+/- minutes, or until chicken is completely cooked. Adjust times for other cuts of meat. We've made this at home twice now, and it really is a great way to grill chicken. Thank you, Todd, for sharing your Pappy's recipe with us (and giving us permission to share it here)! This will likely be our summer recipe for grilling for company!